It is not a matter of painting life. It’s a matter of giving life to a painting. I am going through a period where I am struggling to find focus. My ability to concentrate seems limited and everything, even small tasks, seem like huge distractions which I allow to take over much of my day. Even writing a short blog entry has become an epic struggle to complete, taking twice as long as normal to write a few lines that say little. It’s frustrating and a little scary, with a nagging fear that this will become the new normal, that every task will become a struggle. I worry that the spark that has sustained me for the past two decades has somehow diminished. I’ve been through these episodes before, as I’ve noted here in the past. I can’t say that this is any worse than any of those although it probably seems that way while I’m in the middle of it. I’ve always been able to muddle through it and have usually come out at the other end back in form, the spark in full blaze. But part of me worries that this time might be a different thing. Maybe it’s watching my father living a shallow existence with his dementia in a local nursing home. I find myself worrying that my current lack of concentration might morph into the same short attention span that bedevils him. I tell myself that this a baseless fear but when you’re running on a low spark, your confidence in your own beliefs and strengths becomes a bit strained. Fears, once unthinkable, become plausible. So, trying to find inspiration, I spend some mornings looking at the work of other artists and reading a bit about how they perceived their work and how they coped with the struggles they faced. 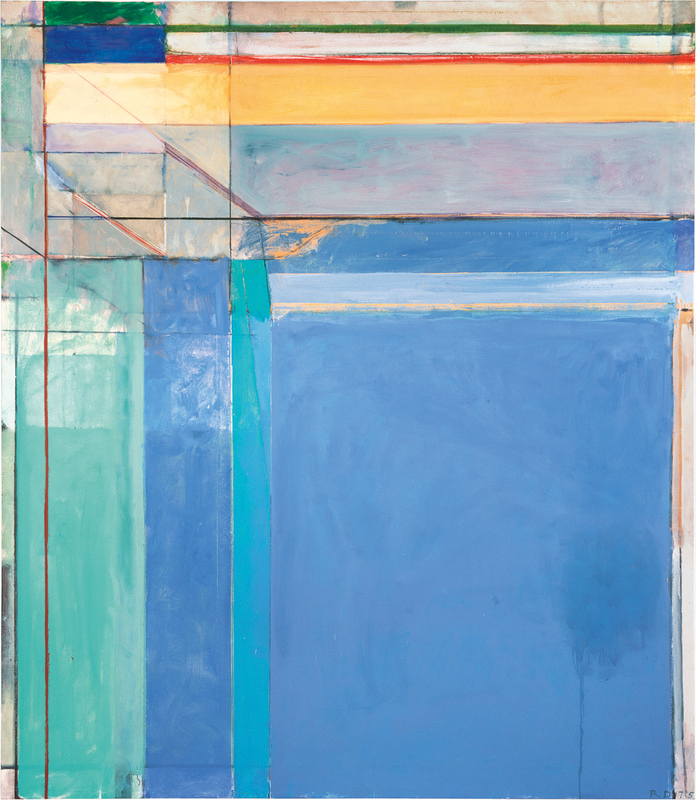 I’ve been a fan of Richard Diebenkorn’s work for some time, especially his Ocean Park series. Ocean Park #79 is shown at the top. I was looking at some of his work this morning and reading a few short quotes from him. The one at the top resonated because it reminds me of what I am trying to do. Another, about the beginning of his process, also spoke to me: Of course, I don’t go into the studio with the idea of ‘saying’ something—that’s ludicrous. What I do is face the blank canvas, which is terrifying. Finally I put a few arbitrary marks on it that start me on some sort of dialogue. I need a dialogue to get going. That is where I am right now. I am trying to start a dialogue, a conversation, with a blank surface. The problem is that on some recent mornings I feel as blank as the empty canvas. That doesn’t make for sparkling dialogue. I read this…and though I am not an artist, I think we all go through these spells…understandably, I here the concern in your writing and will pray this is only a spell and you will find that light you are looking for to move forward. Take care! (just being in this time of year, although holds its own beauty can be a struggle) Hang in there! As I said, this current period is no stranger to me and I know it will pass eventually. But many thanks for your concern, Sheila. It is much appreciated. Are you currently in upstate NY? It’s been quite a lot of gray weather, personally, that tends to drag things down and induce lethargy. I turn on every light and crank up the stereo. Sure, there is always the case to be made this time of year in our part of the world for seasonal-affective disorder. I am sure it plays some part, along with a number of other things. There seems to be more noise (real and imagined) and distraction in this current episode so I am trying to narrow my focus and cut out as many distractions as possible. And maybe turn up the music! Thanks! I hear you! Inspiration will strike again and when it does it will roar with a passionate glow. It is not as if there is no dialogue. Your blog, for example provides a great moment of inspiration for readers like myself. I also love Diebenkorn’s work. All the best. Thanks. I am sure this is going to pass soon. The dialogue I get here is invaluable though it is definitely different than the dialogue that takes place on the surface of a painting. That is more elemental and subconscious, which in an ironic way makes it more real than actual dialogue. All the best to you, as well. Look around in your local stores (or check on line) for some sun spectrum light bulbs and put these in the light fixtures in your house. You wouldn’t think such a little thing like changing out light bulbs would help, but believe me, it does. No, I would believe that such a seemingly small thing as the type of light can affect you in big ways. I have been aware of the effects of seasonal-affective disorder (SAD) for some time and do use full sun spectrum lighting in parts of my studio. But sometimes there are other reasons for one’s funks, things that just have to be waded through. I have a lot of experience and expect this to go away soon, as it always has before. But thank you for your advice. I suspect there’s not much difference between a blank canvas and a blank page: at least, in the feelings it can evoke. But given a choice between a blank canvas and a paint-by-numbers set, that blank canvas has some real advantages. The pure potential it represents can be dizzying, but it can be enlivening, too. It’s just working up that nerve to write that first sentence or make that first mark, especially at those moments when you don’t feel like there is anything left to express. But I do like Annie Dillard’s take on it.